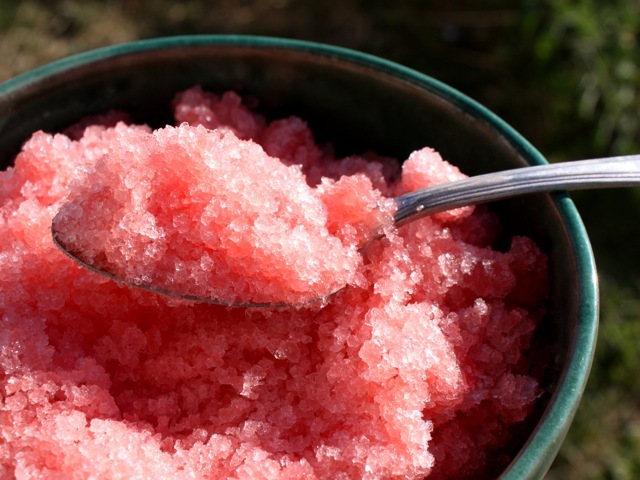 Like Moroccan Mint Granita, this is a lovely summertime dessert that's easy to prepare; the most arduous part involves the technique of repeatedly scraping the ice crystals over a period of a few hours to get that crumbly, shaved-ice texture. In The Perfect Scoop, David Lebovitz suggests serving scoops of granita with whipped cream on top, but I like it all by itself. Working in batches, put the chopped watermelon into a blender and pulse to an even purée. Strain the purée through a medium-mesh strainer to remove any remaining pulp as well as the tiny white seeds (and occasional black ones) generally present in "seedless" watermelon. Pour the strained watermelon water (you will have about 3½ to 4 cups) into a flat-bottomed, freezer-safe container with a capacity of 8 to 10 cups (Tupperware works well for this). Stir the mint simple syrup into the watermelon water, then put it all into the freezer for an hour. Remove and check for ice crystals. If the watermelon water is starting to freeze, stir with a fork to break up the ice crystals. Wait another 30 minutes, then stir again with a fork. Repeat every 30 minutes for a few hours, scraping apart the ice crystals, until you have an evenly frozen mass of crushed ice. To serve, scoop into dessert cups. Don't want to bother with the hassle of scraping? Make Marissa Lippert's Watermelon Mint Pops instead.